Here's a recipe that's received some rave reviews. As of July 2013, everyone who's tried it has given it a perfect rating. This morning, I tried it myself and I have to concur. It was easy to make and really tasty. I liked how the top had a bit of crust while the inside was soft and moist. I used pecans for my version. It certainly didn't hurt that I topped each serving with dab of whipped cream. I wholeheartedly recommend this oatmeal. Coat square pan (9 inch) with nonstick spray. In a large saucepan, bring the milk, brown sugar, margarine, and cinnamon to a boil. 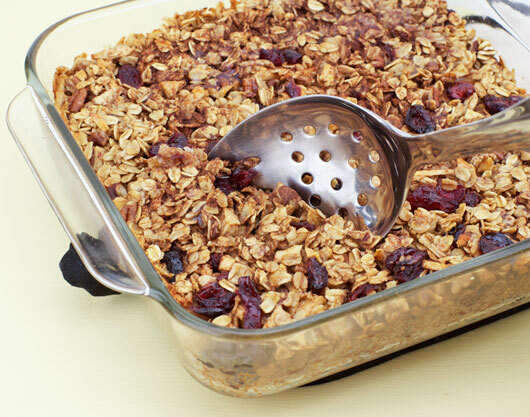 Concurrently, in a large mixing bowl, mix together the oats, chopped apple, cranberries, and nuts; spread evenly into the prepared pan. When the milk mixture begins to boil, pour out evenly over the oatmeal mixture. Bake uncovered for 30-35 minutes, or until the liquid has been absorbed and the oatmeal is tender. 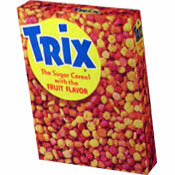 Cut the mixture into 6 servings, scooping each out into a cereal bowl. Garnish with a sliced apple (if desired). 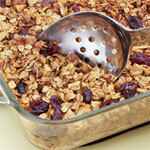 This easy, baked cranberry oatmeal also features chopped apple and pecans (or walnuts). You won't believe how delicious it is! 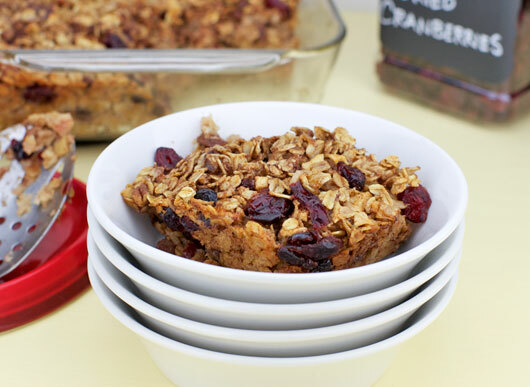 What do you think of Baked Cranberry Oatmeal? This is THE BEST oatmeal ever. Hands down. I've been making this for several years and it's my favorite breakfast ever! Everybody I've made it for asks for the recipe. I switched to almond milk a while back and use Trader Joe's orange dried cranberries. Wow! This has become one of my very favorite breakfasts! I always use Trader Joe's orange-flavored dried cranberries. 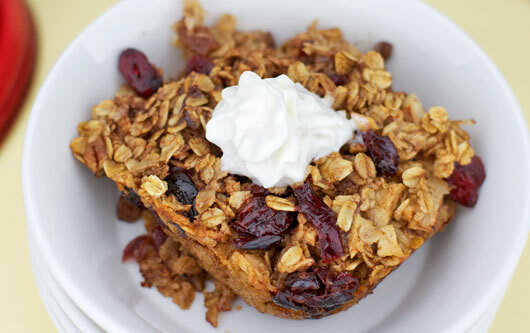 So delicious, and it gets a little healthier with the addition of a couple tablespoons of flax meal. Try it with a little maple syrup for fancy breakfast occasions. YUM! Even with less sugar. We made it with steel cut oatmeal, raw milk and raw butter and it was amazing. Oh, and a little vanilla extract. Great breakfast. I used 3 tsp. cinnamon and we put vanilla yogurt on top. Our three kids loved it! Delicious - tastes like a less sweet version of apple pie! next time I make it I think I'll double the cinnamon - I increased it to 3 teaspoons this time, but I think next time I make it I will use 4. This recipe is a keeper - I will be making it again! Wonderful... Even the kids loved it!!! My five sisters and I went to the Outer Banks for the week-end and I took the ingredients to make this wonderful recipe. Everyone simply loved it. Thank you so much! My first time trying this was at a restaurant and it was not on the menu. It was on a chalk board. So I decided to try it and fell in love with it. I just had to have the recipe. I asked for the cook to come to me but she had left for the day. So they called her on the phone for me. I thought the oatmeal was very good even though I cut back the brown sugar to 4 tablespoons. The only thing this recipe was missing, in my opinion, was a little salt. I just added 1/4 to 1/2 tsp. salt to the milk. This is our family's favorite breakfast.